What is lazy about polymers? Being lazy is bad . . . unless you are a polymer. If you're a polymer, being lazy is great because laziness leads to the slow changes necessary to reach desired release kinetics and to interface with body healing mechanisms for uses in drug delivery and tissue engineering. This page is about polymer degradation and change over time. Emphasis on the word time because for polymer degradation time is a key element that can be controlled. The hope is to provide helpful tips and resources for selecting the right polymer from the wide variety of degradable polyesters provided by PolySciTech, a division of Akina, Inc. For this reason, citations for the information in this page are done in-line, with links to full-text, free online resources and research articles helpful for understanding each step. First, understand degradable polyesters (polylactide, glycolide, caprolactone and copolymers thereof). Yes, there are other polyesters but for now we will stick with these medically-used types. One must first understand the ester hydrolysis reaction which occurs between water and ester bonds. The figure below shows a typical polyester-type hydrolysis degradation reaction between two lactides linked together. This reaction always breaks the ester into a corresponding alcohol and acid. This reaction can be catalyzed by either acidic or basic conditions but proceeds by different mechanisms in each case. Basic conditions – The hydroxide attacks the electrophilic C of the C=O breaking the secondary bond creating an unstable tetrahedral intermediate. This intermediate collapses on itself resulting in the loss of the alkoxide group leading to the carboxylic acid. After this an acid base reaction occurs leaving the hydrogen with the alkoxide group and the carboxylic acid in deprotonated anionic form. FAQ: If ester hydrolysis is so rapid, why are polyesters “lazy”? The bottleneck for ester hydrolysis is not the reaction of the ester, it is the steric hindrance water encounters trying to access the ester. Based on how strongly water is held outside of the biodegrading polymer, the reaction can either be random scissions of the chain throughout the polymer matrix or by primarily surface degradation of exposed esters. As one could imagine, holding water to the exterior of the polymer matrix and encountering only surface degradation renders a polymer very “lazy”. On the other hand if a polymer invites water into the matrix itself then degradation can be quite a bit faster. Degradation however is still pH dependent. An excellent mechanistic discussion of the degradation of P(DL)La is in Schliecker et. al. 2003, http://www.sciencedirect.com/science/article/pii/S0142961203002436, and it shows how in acidic conditions chain-end cleavage is the preferred mechanism while in basic conditions random cleavage is the predominant mechanism. By and large the human body is moderately basic pH (7.2-7.4, the gastric chamber is another story) but strongly acidic conditions can be encountered by the polymer—not from the body but from the polymer itself. FAQ: The polymer makes its own acid, huh? As the polymer degrades it forms acidic components (short chain lactic/glycolic/caprolactic acid oligomers or monomers thereof). This can create a strongly acidic interior to the polymer which can auto-catalyze degradation (see Lu et. al. 2000, http://www.sciencedirect.com/science/article/pii/S0142961200000478). This effect is so strong that, in fact, it can lead to the counter-intuitive result in which larger microparticles degrade at a faster rate than smaller microparticles. It's due to increased accumulation of acidic components in the interior (Dunne et. al. 2000, http://www.sciencedirect.com/science/article/pii/S0142961200000405). Poly(Esters) 103: A bunch of different looking esters in a row hydrolyzing. OK, so we got the ester breaking into acid and alcohol down pat. FAQ: Aren't all polyesters the same? The answer to this is an emphatic “no”! For simplicity we are going to constrain the discussion to lactides, glycolides, and caprolactones. There are plenty of other polyester derivatives (PHB, polydioxanone, etc.) but the fundamental principles of polymer impact on degradation can be understood from these three molecules. These principles can be applied to other molecules by considering their steric properties and polymer packing to get a relative feel for degradation properties. Glycolide is as simple as a polyester gets. There is no substantial steric hinderance to water on an individual molecule level but pure polyglycolide is extremely slow to degrade due to its stacking and arrangement. More on that later. Let's introduce the others first. Lactide has one additional methyl side chain, which does on a single-molecule level increase the steric hinderance to the ester linkage slightly. More importantly, however, the additional methyl side chain renders the central carbon chiral, so lactide has two chiral forms as a loose acid: L-lactic acid and D-lactic acid. L-lactic acid is naturally obtained from fermentation of starch (see http://www.ch.ic.ac.uk/marshall/4A3/4A31.pdf). D-lactic acid doesn't occur in nature but racemic mixtures of L/D lactic acid occur from chemically synthetic generation methods. You effectively never see Poly(D-Lactide). Technically it can exist but it is rarely generated or used. Poly(lactide) comes in two primary forms. Poly(L-lactide) and Poly(D,L-lactide). Despite the fact that there is not a single molecule different between these two polymers their performance in terms of degradation and processing differs drastically (http://www.uobabylon.edu.iq/eprints/paper_5_24326_775.pdf). Polycaprolactone doesn't have any additional side-chains to create chiral centers but it does have exceptional water-permeation resistance because the extra-long alkyl backbone between ester groups creates a more hydrophobic condition which resists water. Poly(Esters) 104: A bunch of polyester rows packed together hydrolyzing. Polymers are, molecularly speaking, like noodles of spaghetti. They are long and flexible and easily entangle each other. Chemical cross-links can be considered to be like tying the spaghetti noodles together with string. When polymer chains are attracted to each other and pack together easily, the noodles form tight interactions and tend to line-up in orderly rows (referred to as crystallinity). When polymer chains are randomly arranged and do not pack well together, they tend to be disorganized and loosely associated (referred to as amorphous). Depending on polymer chemistry certain polymers tend to form into crystalline domains and others tend to form into amorphous domains. But this key point must be understood: Processing methods also impact polymer packing properties! Often you may see polymers categorized as being amorphous or crystalline and some polymers have such a tendency toward one or the other. Categorizing them is appropriate. However, to treat a polymer which has been hot-melt extruded with a strong draw and a slow cooling speed the same as a polymer which was simply solvent cast or O/W emulsion processed to microparticles, is to deny the true, flexible, nature of polymers. Their packing properties can be changed by the physical processes that form them. When dissolved in solvent, polymers are completely unpacked and the strings float loose in solution with little to no interaction. As the solvent dries, the strings become closer and closer associated. Similarly, in melt processing at a high enough temperature the gain in entropy outweighs the enthalpic attraction the polymers have toward each other, but as the temperature cools the polymers become closer and closer aligned to one another. In either case the speed at which this happens and external forces are critical. Slower “solidification” times favor crystalline arrangement as the polymers have time to arrange into the most preferential form. Pulling or applying physical force to the polymer tends to force the chains to form along the line of force (similar to pulling a knot of wet spaghetti tends to force the spaghetti noodles to line-up in a row) and this induces directional crystallinity. Another example is LDPE shopping bags like those handed out at grocery stores. If you take the shopping bag and pull hard on a portion it will become thin, opaque, and strong. This is due to the LDPE chains lining up under a force. 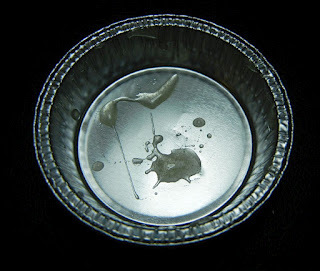 There are a variety of techniques to define quantitatively how crystalline a polymer is though one can also get a qualitative feel visually as pure, crystalline polymers tend to be opaque, white, and stiff (Here, I'm excluding polymers doped with TiO2 to obtain this appearance) while amorphous are clear/gelatinous in appearance. For mechanical load-bearing usage crystalline polymers are much preferred to amorphous polymers and an excellent paper on polymer chemistry and mechanical design (in this case for bone-components where mechanical strength is key) is presented by Middleton and Tipton, 2000 (http://www.sciencedirect.com/science/article/pii/S0142961200001010 ). FAQ: Why do I need to consider polymer crystallinity? An extremely important aspect of polymer crystallinity in terms of degradation is: highly-packed crystalline polymer domains exclude water while loosely-packed amorphous domains invite water in. Crystalline polymers are “lazy”. Crystallinity is key to degradation because it controls access to water which is the rate-limiting step for polyester hydrolysis. Note that polymer chemistry is also important. Some polymers will effectively never align in a crystalline fashion no matter how hard one tries. There have been requests for PolyVivo AK12 (pictured) to be provided as a crystalline material. The problem is the length of the polymer (total MW is only ~4000 Da), combined with its chemical nature as a PLGA-PEG-PLGA, prevents it from being generated as a crystalline material because the lack of attraction combined with steric hinderance prevent polymer packing in almost all situations. The steric hinderance between the chains of polymers is key. To understand this, the various monomers discussed above can be pictured more or less as shown below. Blue indicates cleavable/hydrophilic regions while green indicates hydrophobic alkyl regions. With this simplified pictorial description the various molecular polymer “spaghetti noodles” can be pictures as below. Poly(glycolic acid) (PGA) In and of itself glycolide is the most hydrophilic monomer but poly(glycolic acid) is one of the most crystalline polymers available. In fact its crystalline nature is so strong that it is insoluble in most organic solvents (such as dichloromethane) due to its tight packing. It can be dissolved in hexafluoroisopropanol(HFIP) but this solvent is fairly expensive. This leads to an extremely slow degradation time. By itself however the lack of organic solubility in common solvents makes PGA little used. Poly(D,L lactide-co-glycolide) Ironically addition of a more alkyl monomer which presents on a single molecule level a greater amount of steric hinderance to water access drastically speeds up degradation. As shown in the picture the randomly arranged lactide bonds keep the polymer chains from packing close to each other which reduces crystallinity and allows for more rapid degradation. PLGA is available in a wide range of both molecular weights and lactide to glycolide ratios. As the molecular weight increases degradation is slower due to many scissions being necessary to break down a long chain and as the lactide content increases the degradation is slower due to increased alkyl hydrophobication and potential to form crystalline domains. 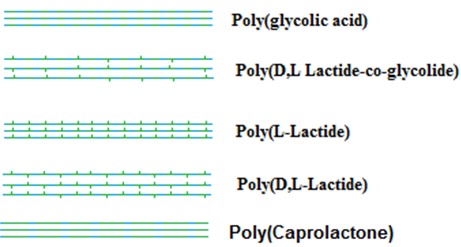 Poly(L-Lactide) Has a drastically higher crystallinity and degradation time than the Poly(D,L-Lactide) due to the simple fact that the methyl units are all arranged on one side of the polymer chain allowing for closer packing. Poly(Caprolactone) looks like PGA and has nice crystalline packing but does have a few key differences. The extended alkyl chain boosts overall hydrophobicity which keeps water out and slows degradation. The longer alkyl chain also leads to a relatively lower degree of self-association between the chains which makes PCL more flexible and capable of organic solvent dissolution than PGA. A popular combo is Poly(lactide)-co-(caprolactone). Here the lactide reduces the degree of close packing between caprolactones leaving the polymer with nice elastic properties while maintaining a relatively slow degradation profile. A good discussion of these processes and polymer chemistry impact can be found in a review paper by Jain, 2000, "The manufacturing techniques of various drug loaded biodegradable poly(lactide-co-glycolide) (PLGA) devices". By understanding these principles you can pick out a polymer from www.polyscitech.com which is exactly as lazy as you need it to be.